The Montana softball team, which traveled more than 15,000 round-trip miles for its first five tournaments of the season, will open a well-deserved home stand this week when it hosts the Grizzly Classic at Grizzly Softball Field. Montana will be joined at the three-day, eight-game tournament by Maine and Seattle, with games beginning Friday morning and continuing through Sunday afternoon. Coverage: All eight games will have free video coverage through Eversport as well as live stats. Links to all available services can be found on the softball schedule page at gogriz.com. Montana at a glance: After playing tournaments in Iowa, California, Hawaii, Utah and Oklahoma, the Grizzlies (9-14) will be making their home debut this week, where they are 23-11 the last two seasons and winners of nine of their last 10 dating back to last spring. Montana went 2-2 last week at Tulsa’s tournament, with a 3-1 loss to the host Golden Hurricane, an 8-5 victory over Texas Tech, a 7-0 loss to No. 19 California and a 3-1 win over Wichita State. It was the third straight weekend the Grizzlies played against a ranked opponent. Seattle at a glance: The Redhawks are 6-16, with two of those wins coming against Montana at Santa Clara’s tournament four weeks ago. Playing in Hawaii last week, Seattle twice defeated the host Rainbow Wahine, who defeated Montana 9-3 last month, by scores of 4-3 and 4-1. The Redhawks also own an 8-2 win over Sacramento State, which was picked second in the Big Sky Conference preseason coaches’ poll, one spot ahead of Montana. Maine at a glance: With a winter storm hitting the East Coast, the Black Bears (2-9) are on an extended trip west. Maine is in Utah this week, playing a doubleheader against Utah Valley on Tuesday and a twin bill at BYU on Wednesday before traveling to Missoula. Because of travel problems, Maine couldn’t start the season until less than two weeks ago. The Black Bears went 1-4 at Grand Canyon’s tournament, lost a 9-0 game at No. 21 Arizona State last Wednesday, then went 1-4 against No. 25 Wisconsin and Colorado State last weekend at Fort Collins, Colo.
Maine won last year’s America East championship and advanced to the NCAA tournament. The Black Bears, with 19 of 20 players back from last year’s team, were the unanimous selection to repeat as league champions. 1. When Montana played Seattle last month at Santa Clara’s tournament, the Redhawks twice held the Grizzlies in check, winning 6-3 and 2-0. In the opener, senior Alyssa Reuble shut Montana down the final five innings after allowing the Grizzlies to grab an early 3-0 lead. She gave up six hits while striking out four. The next day sophomore Andie Larkins was even better. She allowed just one hit in seven innings, a single by Ashlyn Lyons in the fifth, to shut Montana out for the first time since last March 20. Reuble threw a five-inning perfect game against South Dakota on Friday, facing 15 batters and needing just 41 pitches. It was the first perfect game thrown by an NCAA Division I pitcher this season. She was announced as the WAC Pitcher of the Week on Monday. Those two pitchers have accounted for all but one of Seattle’s decisions this year and will likely start all three games that Seattle faces Montana this week. 2. The emergence of freshman Anne Marie Petrino gives Montana a player threatening to hit .300 in the No. 8 spot. Petrino had three hits through the season’s first three tournaments while playing in six of 14 games but has been a starter since the team’s trip to St. George, Utah. In Montana’s nine games the last two tournaments, Petrino, with three multiple-hit games, is batting .320 to raise her season average to .282. She has been starting in left field. “When we got to St. George and saw the hard surface, we knew it was going to be a slapper tournament. She utilized it and got hot, so we’ve left her in the lineup,” said Pinkerton. “She’s doing some things well for us. 3. At this point last year, Montana was batting .287. This year the Grizzlies are batting .264 going into their home tournament. Which means all is not well in Grizzlyville, right? Not so fast. Montana has two more wins than this time last year against a tougher schedule. And the team has a 4.27 ERA. At this time last year, the pitching staff had an ERA of 6.03. Last year’s team used the back half of March and April to raise its final batting average to .326. Expect this year’s team to see a similar jump as the weather warms and Montana starts getting some games at home, where the Grizzlies batted .353 last year. “A lot of people have been wondering why our team batting average is down. We’ve played a lot better competition this season than our first two years, that’s one thing to do with it,” said Pinkerton, whose team batted .172 in four games against ranked opponents this season. 4. One of the reasons Montana’s batting average is down is because of MaKenna McGill‘s hitting slump. The centerfielder, who hit .374 last spring to earn second-team All-Big Sky honors, has just three hits the last 16 games. Her season average has dropped to .203. McGill was 9 for 16 at Montana’s season-opening tournament at Northern Iowa. She’s had just six hits since then. “She’s run into some tough luck, which is a part of most slumps for good hitters, but she’s also not staying within herself,” said Pinkerton. “When you start scuffling a little bit, you start expanding your zone and then getting yourself out. Sydney Stites, last year’s Big Sky Freshman of the Year, is also down with her batting average through the early part of the season. She batted .383 a year ago but is at .244 through 23 games this spring. She still has a team-high 17 RBIs, which rank fourth in the Big Sky. 5. Montana went 11-5 at home in its first year, in 2015, then 12-6 last spring, with wins in nine of its last 10 games. The Grizzlies drew an average of 486 fans in year one to rank 44th nationally, 423 last year. “Of course there is a familiarity. We know the nuances of our park, where the dugouts are, where the fences are, so defensively there is a comfort level to playing at home,” said Pinkerton. 6. Maddy Stensby made two appearances at Tulsa last week and had a 1.24 ERA but a 0-1 record. She got the start against California and allowed one run in three and 2/3 innings. That kept the Grizzlies in the game, but it also gave her the loss in what would turn out to be a 7-0 defeat. Against Wichita State on Sunday, she pitched two innings of one-hit relief in place of Colleen Driscoll in Montana’s 3-1 win to collect her first save of the season, the second of her career. 7. Montana’s top two hitters are doing work. Bethany Olea hit .455 in four games at Tulsa to raise her season batting average to .394, the fourth-best mark in the Big Sky. Her 10 doubles are tied for the league lead, her 14 walks are one off the lead. 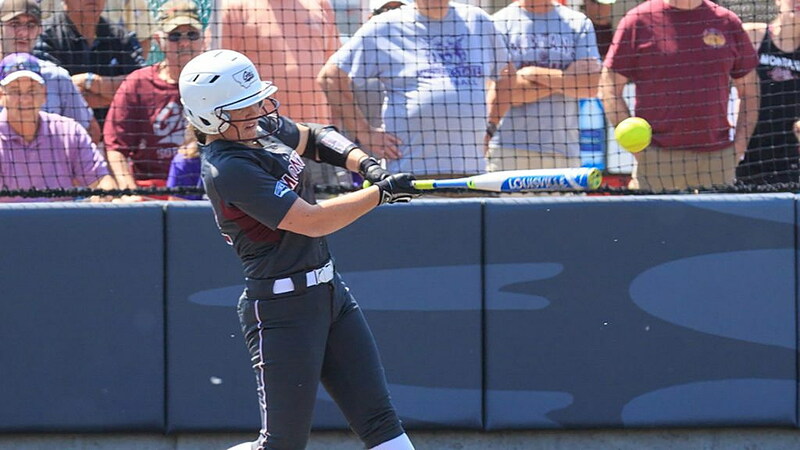 Delene Colburn had just two hits in four games at Tulsa last week, but it was her two-out double in the third on Sunday against Wichita State that drove in two and gave Montana a lead it would hold the rest of the game. Her .368 batting average ranks seventh in the Big Sky, her five home runs are one off the Big Sky lead. 8. In the big picture of the Big Sky, Montana is sitting just fine. The team’s .264 batting average ranks third behind Weber State (.315) and Idaho State (.273) and is ahead of the league’s overall average of .255. The Grizzlies have the Big Sky’s top fielding percentage of .968, which is up from the team’s .958 percentage in 2015 and .964 last spring. And Montana’s ERA of 4.27 ranks third behind Sacramento State (3.62) and Weber State (4.26). Upcoming: This weekend’s six home games are the first of 14 straight at home at Grizzly Softball Field for Montana. The Grizzlies will have a doubleheader against Boise State next Tuesday, then open league with three-game home series against North Dakota and Southern Utah.